We arrived in Obertilliach Austria on Wednesday 18th January, a few days before the weekend of Dolomitenlauf events. Obertilliach is a small mountain village with a population of 700, mostly farmers at about 1500 metres elevation. The farmland is all covered in snow and the cows are all in the barns in the village. It was great to familiarise ourselves with the course with a few other skiers. It was also a relief to realise that the course is now 2x 21km loops on a lot flatter terrain than in previous years. In 2001, the 60km Dolomiten freestyle was held at Obertilliach as there was insufficient snow in Lienz. As we recall, it was a very hilly course, involving climbing up the open slope zig-zags twice as well as a couple of other significant steep climbs on a narrow track in the forest. So, we were pleased to see the easier flatter course was to be used this year, for both the classic and freestyle events. On the Friday evening there was a Worldloppet reception where quite a few Worldloppet Masters from a variety of countries gathered to socialise. We were in awe to be welcomed in 3 different languages by the talented race official, as coming from Australia anyone speaking 2 languages is amazing to us. 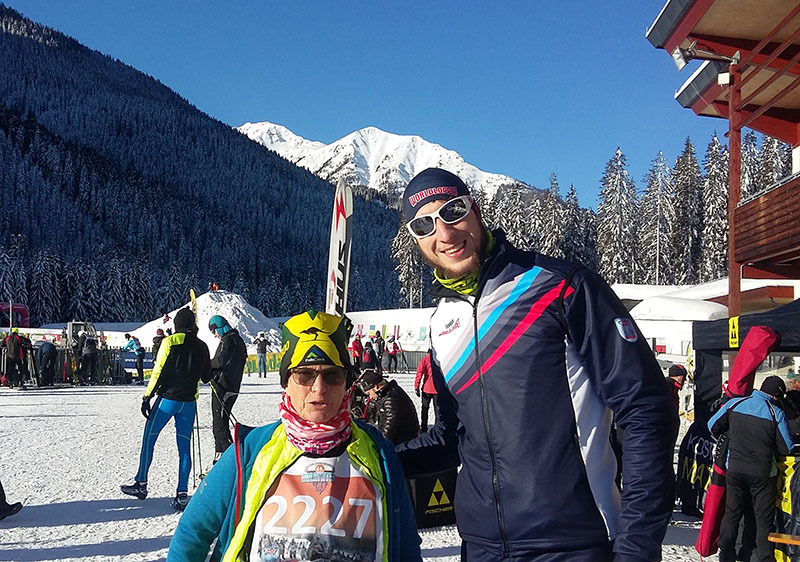 After the reception, the exciting Elite Sprints were held at BiathlonZentrum, rather than in Lienz, as we had become accustomed to in previous years. Staying at Obertilliach we realised, was an absolute bonus with most Dolomitenlauf events now being based at Obertilliach. Our choice of Obererlacher Gaestehaus was incredible, as it turned out to be only 50 metres from the finish line which we hadn’t realised when we booked. Also the after race meal was literally across the road. There are numerous well-located guesthouses and hotels in Obertilliach and certainly save the travel up from Leinz; so our recommendation is to stay in Obertilliach. Saturday 20th January dawned clear and sunny; a magical day for the classic Dolomitenlauf race. 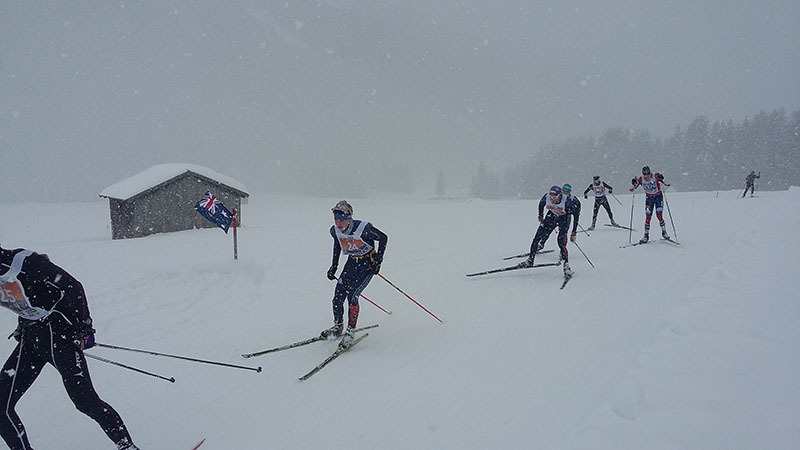 At Biathlonzentrum some 412 entrants gathered for the 42km race and 144 for the 20km classic. Temperatures were varied with a cold start, then we skied into the sun up the hill towards Obertilliach village and warmed up very quickly. There seemed less zig-zags than I remembered which was wonderful. It was a real hoot to shoot down the zig-zags between the many little barns that dotted the open hillside, past a tiny church and we quickly arrived at the first drink station before having more gentle downhill to the far end of the course beyond Untertilliach. Crossing the creek, the temperature seemed to plummet as the cold air hung by the tiny stream and snow still clung to the tiny trees and bushes. Fortunately, it was gradual uphill so this warmed us up. The track re-crossed the creek several times even popping back into the welcome sunshine for a brief few minutes. The narrow track wound up the valley right on the edge of the babbling stream to the second drink station in a sunny spot. Continuing up, up finally reaching the farthest point of the course it was downhill and some good gliding to Biathlonzentrum drink station. 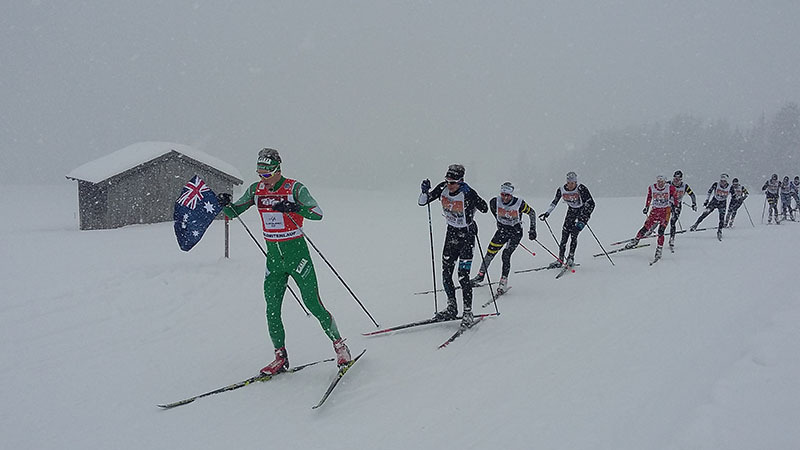 Then it was time for the 42km skiers to do it all again. By now the fastest skiers had already lapped me and as I headed off to ski my second lap the elite were heading to the finish line right in the main street of Obertiliach. The classic tracks had glazed a little by the second lap so it was a little faster. The last 2km of the course was uphill but it was a wonderful atmosphere to finish in the main street of Obertilliach and have the post race meal in the kindergarten hall where friendly locals served pasta, goulash soup and beer. We woke on Sunday morning to about 10cm of fresh snow covering everything. Light snow was still falling as 306 skiers lined up at the start line for the 1st stage of the World Cup 42km freestyle event and 180 for the shorter 20km event. The temperature seemed just below zero and was relatively still. As the gun fired everyone surged ahead until the first hill when it was quite chaotic with everyone trying to find their pace. Sunday’s course was a mirror image of Saturday’s though the weather conditions were very different making it feel like a totally different location. Because of the continuing light snowfalls, the frontrunners pushed through the soft snow compacting a platform in the middle of the track for us slower skiers. It was great to skate from. Due to the snow compaction there was much more glide in the second loop. There was even classic tracks for the few intrepid skiers who used the classic technique in the freestyle event though the tracks were fairly slow due to little use. The after race meal was great with plenty of pasta, goulash soup and beer. 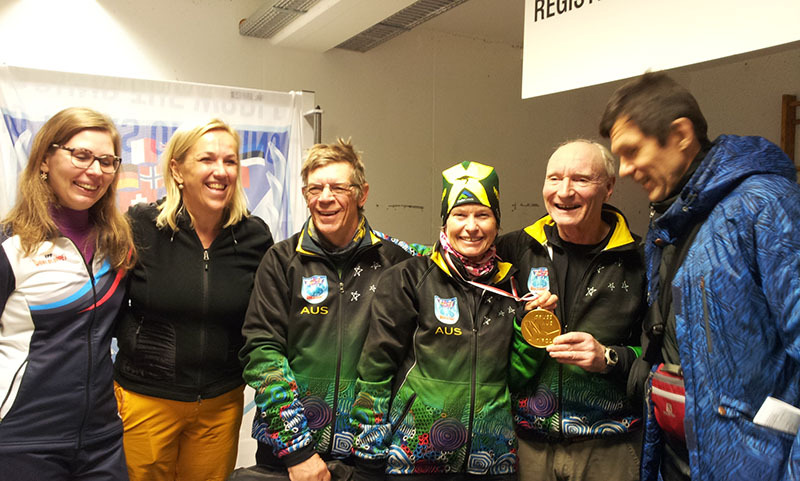 And provided an opportunity to share the day’s achievements and stories with old and new skier friends. Grooming was perfect on both days. Congratulations to the Dolomitenlauf team for putting on an exceptional event; well done and thanks to all the volunteers.